“Operational improvement” is a much hailed significant source of value creation by private equity (PE) firms in PE-backed companies. Although operational improvement can immediately be understood as a process of making a business run more efficiently, what it actually involves is seldom articulated in any detail. Operational improvement can be addressed on multiple dimensions. 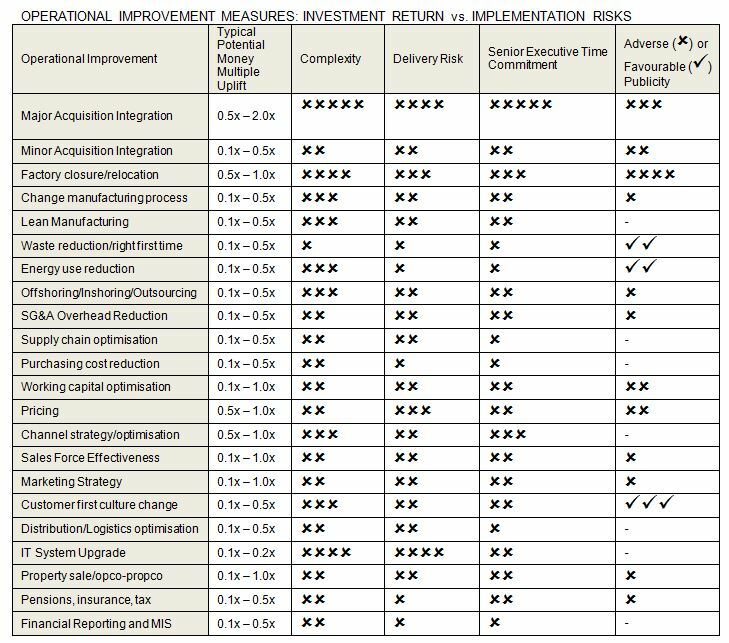 22 areas of possible focus listed in the matrix below range from the integration of a large acquisition to improving sales force effectiveness, to overhead reduction, to optimising financial reporting and management information systems. Each area has the potential to deliver different levels of value creation, shown in the matrix as the typical increase that might be generated in the money multiple of the PE firm’s equity investment. An IT system upgrade, while perhaps critical for business operations and maintenance of competitiveness, will typically act to preserve rather than enhance value; increasing sales force effectiveness on the other hand can be immediately value accretive. Each area of focus is, however, likely to require differing degrees of senior management attention and to entail different levels of implementation complexity and delivery risk. A programme to reduce purchasing costs should have relatively low delivery risk and require less senior management time in comparison to, for instance, a decision to adopt lean manufacturing. Different operational improvement activities can have very different consequences in terms of how they may be perceived inside and outside a business. Improving energy efficiency will be likely to be positively perceived internally and externally. In contrast, offshoring or outsourcing production can have major HR and public relations implications. These different considerations and their relative magnitudes are shown by ticks and crosses in the matrix. While all of the operational improvement areas have the potential to add value, they should not be considered a shopping list applied in every situation. Rather, PE is typically very selective, choosing to concentrate on three or four areas at most in any given business at any one time. Experience shows that attempting to tackle any more than this will overburden management and produce poor outcomes. Once initial areas have been covered, further improvements can be delivered in subsequent and successive phases. Perhaps reflecting foundations in Frederick Winslow Taylor’s The Principles of Scientific Management (1911), which was largely based on observations of working practices in the steel industry, operational improvement is most commonly associated with manufacturing companies. Its use by PE firms, and the understanding that any company’s operations and efficiency can be improved, is however general, and PE will typically seek to apply operational improvement across a wide span of investment sectors ranging from manufacturing and industrial to healthcare to support services to consumer retail and technology, media and telecommunications. Due diligence conducted by the PE firm in the process of investing in the business may have identified areas with particular potential for operational improvement. These are likely to be a first focus. PE will also examine the previous owner’s operating model, aiming to build on established strengths, but also to look to measures which can lead to a permanent release of cash or raise EBITDA margins which have not previously been given emphasis. Working capital control and the adoption of more sophisticated pricing strategies can be typical examples. Where an improvement is expected to be self-funding, PE will assess the opportunity using conventional measures such as pay-back period, return on investment and return on capital employed. With/without impact on PE the investment multiple will also come into play, especially if the improvement requires new equity investment. In judging operational improvement’s contribution to PE investment returns, it can be difficult to disentangle with precision the value creation generated by operational improvement compared to that from underlying earnings growth, de-leveraging and exit earnings multiple enhancement. At the same time as increasing earnings, operational improvement should also improve cash generation and by this contribute to de-leveraging. Operational improvement which increases the rate of EBITDA growth and EBITDA margins will also likely lead to the business value being set on a higher earnings multiple in a sale or IPO. Operational improvement’s contribution to PE investment returns is nevertheless significant. On a PE investment which delivered a 2.0x to 2.5x money multiple on equity invested, half or more of the 1.5x uplift in equity value may have come from operational improvement. Graham Oldroyd is a former partner and head of Manufacturing & Industrial Investment at Bridgepoint Private Equity and an INSEAD alumnus (MBA Dec ’89). He is also a contributor to the INSEAD Global Private Equity Initiative (GPEI).